We’re down to the final four in the Australian Open men’s singles event, with Novak Djokovic, Rafael Nadal, Stefanos Tsitsipas, and Lucas Pouille vying for the title. Nadal vs. Tsitsipas will be played first on Thursday, while Djokovic and Pouille are colliding on Friday. Ricky previews the action and makes his predictions. For the most part, Rafael Nadal has set the NextGen charge back 100 years. Well, maybe not that long; but the Spaniard has certainly played his part among the old guard in keeping the youngsters’ at bay. Putting to bed any concerns about injuries or rust , Nadal has run roughshod through the draw–including at the expense of up-and-comers Alex de Minaur and Frances Tiafoe. The 17-time major winner also made clobbered veterans James Duckworth, Matthew Ebden, and Tomas Berdych. Nadal, who is quite obviously more well-rested than rusty following his most recent layoff, has been pushed to only one tiebreaker by Berdych. And it should be noted that the first two sets of that contest were 6-0 and 6-1. The Spaniard surrendered only 16 total games in his two matches against de Minaur (seven) and Tiafoe (nine). Tsitsipas knows the feeling. He is 0-2 lifetime against Nadal with two straight-set losses, and three of their four sets have been 6-2 or worse. The 20-year-old Greek has been the sensation of this fortnight, surviving tough four-setters against Matteo Berrettini, Viktor Troicki, and Nikoloz Basilashvili before doing the same–in much grander fashion–against Roger Federer with a 6-7(11), 7-6(3), 7-5, 7-6(5) fourth-round upset. The world No. 15 followed up the biggest win of his career by beating Roberto Bautista Agut, who was also running low on emotional and physical energy, via a 7-5, 4-6, 6-4, 7-6(2) scoreline. Now Tsitsipas must rearrange his goals in a hurry, because Nadal will pounce on any sort of satisfaction or complacency. Happy to be in the quarters, Tiafoe came out flat against Nadal, dropped serve right away, and never got into the match en route to a 6-3, 6-4, 6-2 blowout. Tsitsipas cannot afford a similarly slow start. Given the enormity of the stage and their respective paths through the event, this should be one-way traffic for Nadal. It has been a fortnight of first for Pouille and his reward is a first-ever meeting with Djokovic on Friday night. 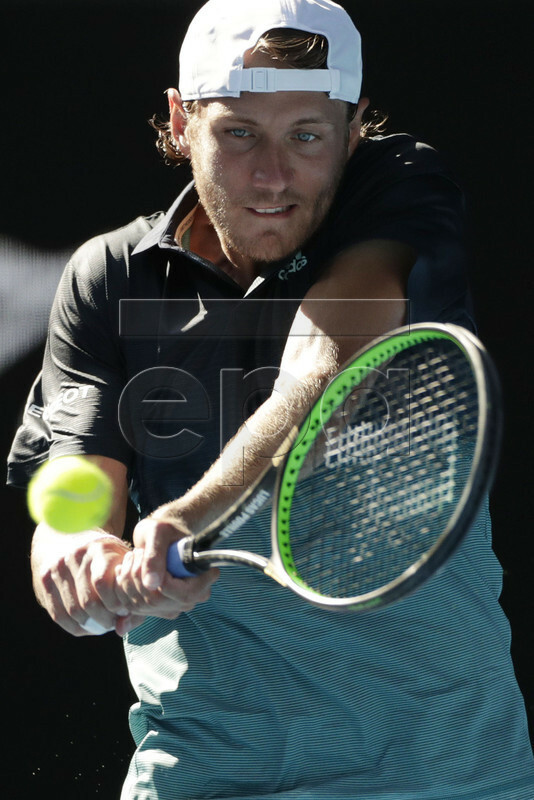 Pouille had never previously won a single match at the Australian Open (0-5 lifetime). He had never reached a Grand Slam semifinal. He also had not won a match this season (0-4 at the Hopman Cup and in Sydney). But with a new team around him–led by coach Amelie Mauresmo–it has all turned around for Pouille from completely out of nowhere. The Frenchman has advanced this fortnight with defeats of Mikhail Kukushkin, Maximilian Marterer, Alexei Popyrin, Borna Coric, and Milos Raonic. Pouille may not be quite as excited for this matchup. After all, who wants to run into Djokovic at the Aussie Open? The 31-year-old is already a six-time champion of this event and he is an obvious favorite to lift the trophy yet against as the current world No. 1 and reigning champion of both Wimbledon and the U.S. Open. Djokovic, who has surrendered just two sets so far to Denis Shapovalov and Daniil Medvedev, is coming off a second-set retirement from Kei Nishikori on Wednesday that will replenish the fuel tank on the heels of a relatively difficult fourth-rounder against Medvedev. Whereas it was Pouille who forced Raonic to change–or try to change–his game-plan, this time he will be the one who has to mix things up because his opponent will almost certainly enjoy the upper hand in most baseline exchanges. Respective current form suggests the underdog may have a chance of snagging a set, but Djokovic won’t donate any more than that; not at his favorite tournament and not on his favorite court.